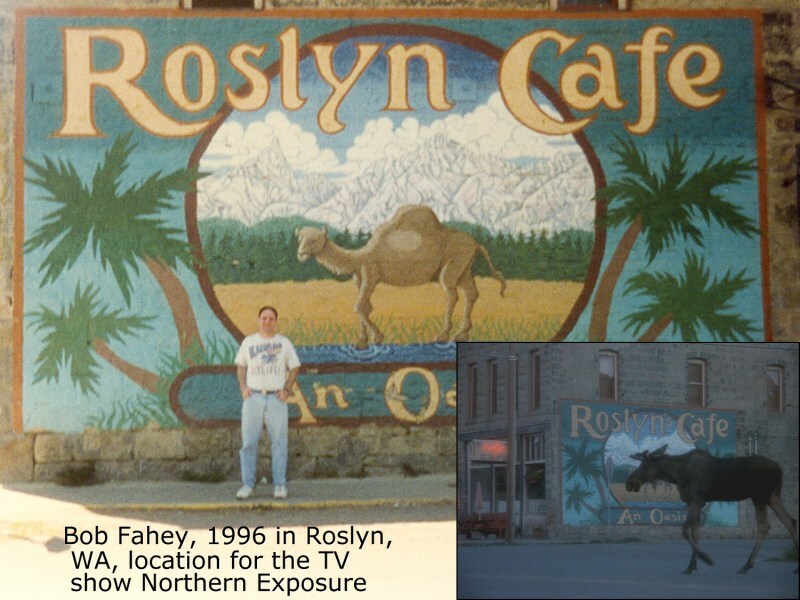 Bob by the Roslyn Cafe sign in Roslyn, WA. 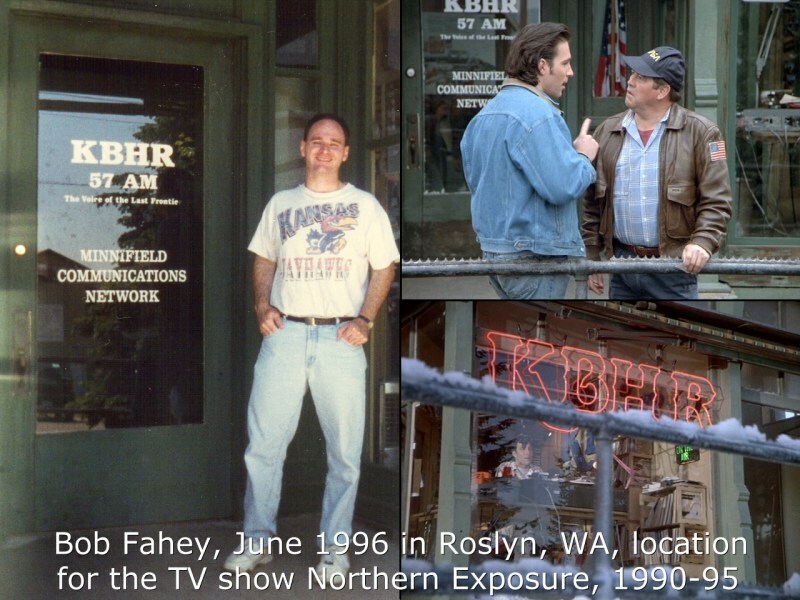 You saw the moose walk past it every week in the opening credits of the TV show Northern Exposure. 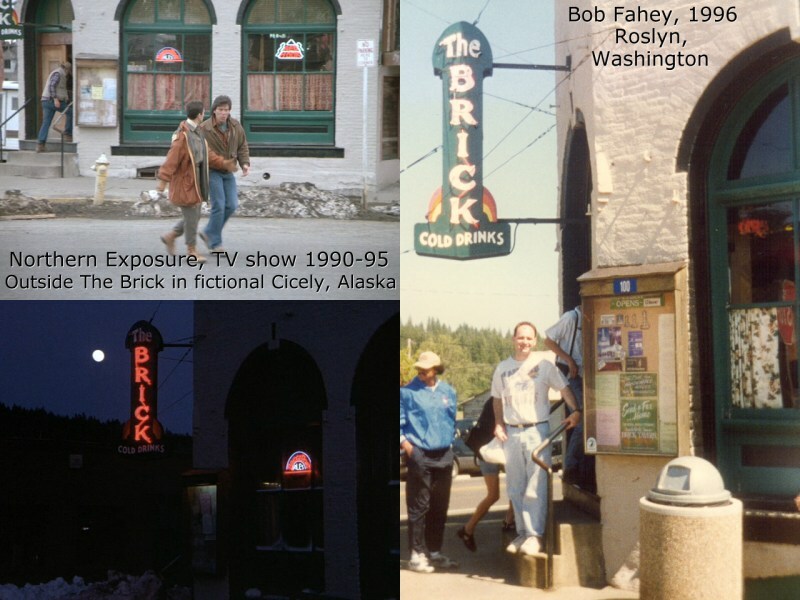 The show was set in fictional Cicely, Alaska, so they put " 's " at the end of Roslyn to make it a person's name. The Beatles cross Abbey Road near their London recording studio for their famous album cover. 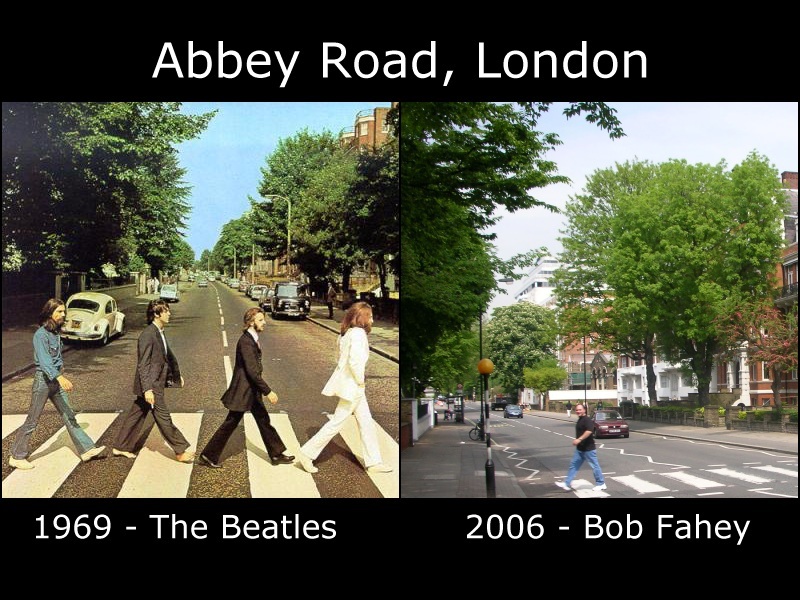 Decades later Bob does the same, going the wrong way of course. 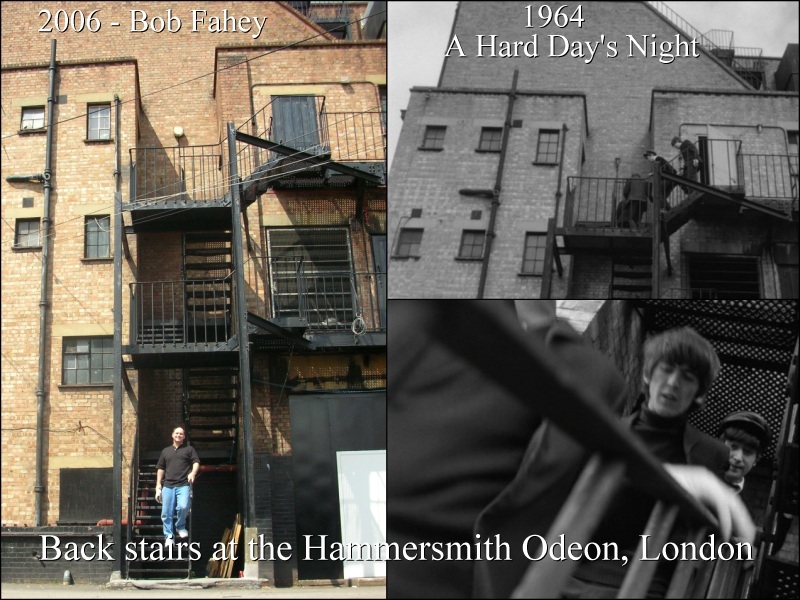 The spot looks almost exactly the same, the big change being the addition of the squiggly lines on the pavement. 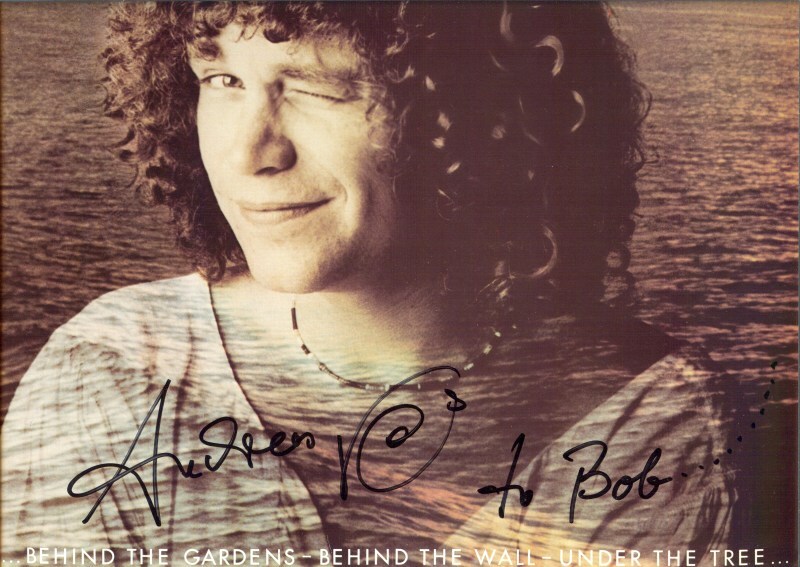 It's VERY hard to get the same angle as the album cover because the camera person will get run over by the traffic. 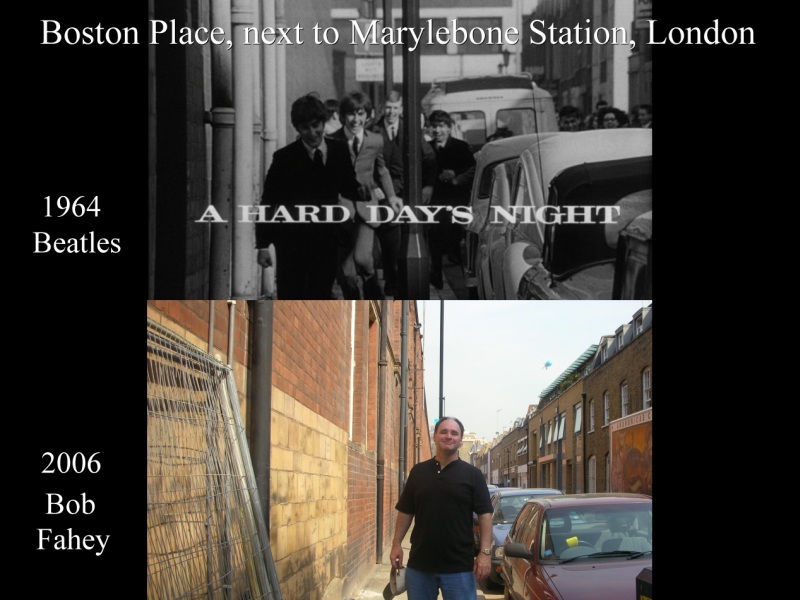 This narrow street by Marylebone station is the title shot of the Beatles' 'Hard Day's Night.' I'm not standing in quite the right spot, but you can see I'm in the general area. 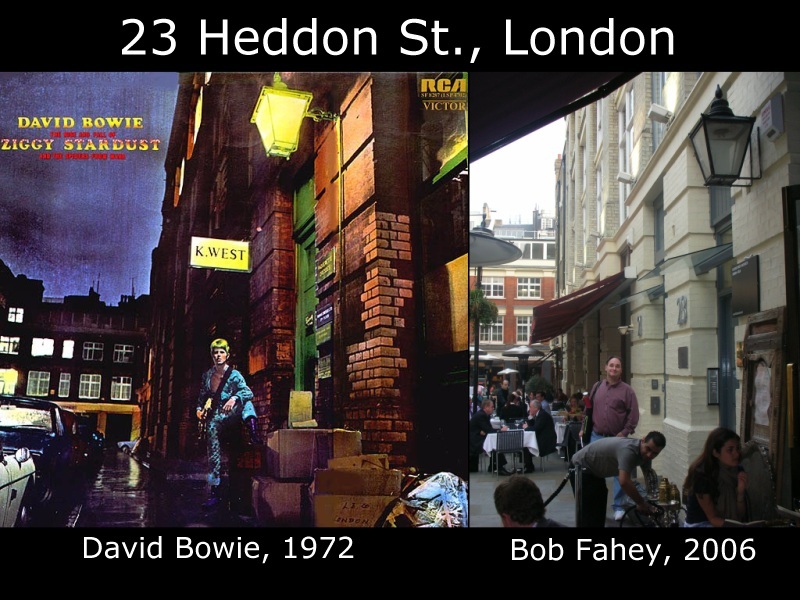 This spot is almost unrecognizable now, but look closely and you can see it's where David Bowie stood for the cover of his classic 'Ziggy Stardust' album. 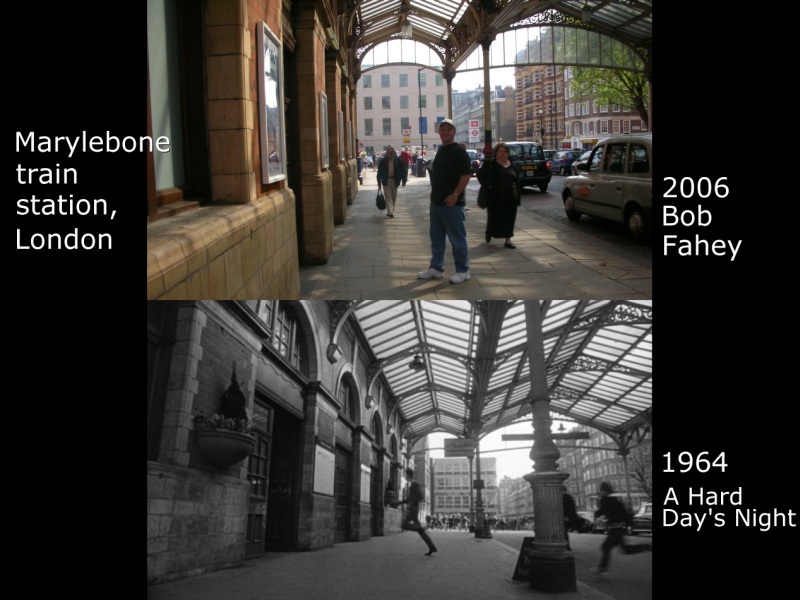 In this scene in 'Hard Day's Night,' the Beatles sprinted into Marylebone station to board a train and escape overexcited fans. If they ran through these doors now, they'd stop short in a convenience store. The station door has been moved down the street. 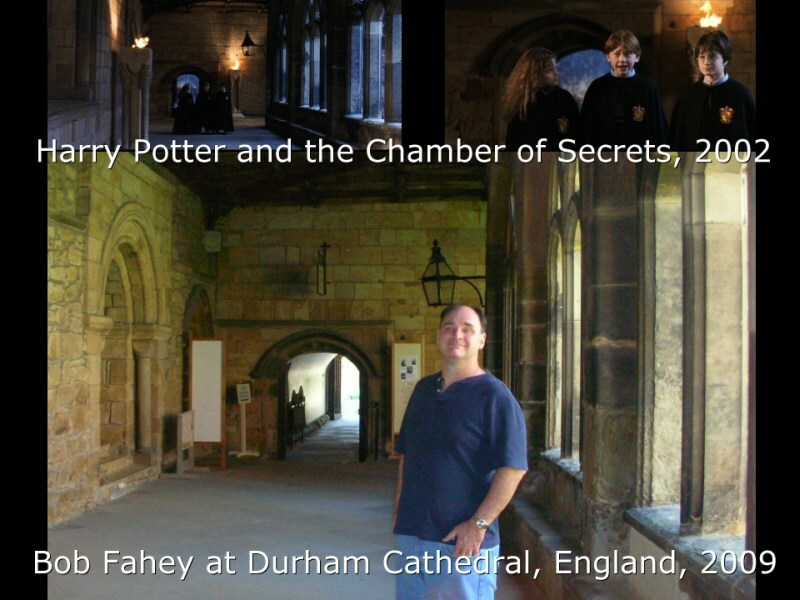 Hanging with Harry Potter at Hogwart's, through in my case it's Durham Cathedral, Durham. 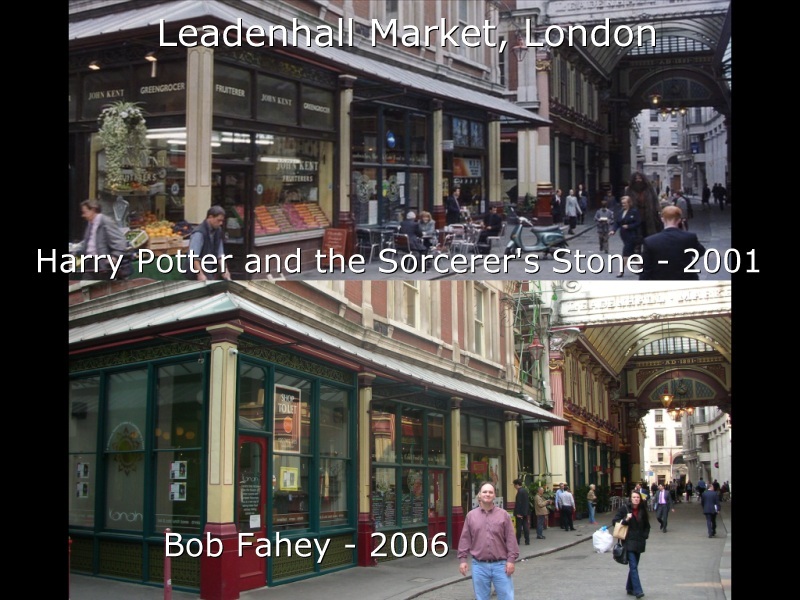 Hanging with Harry Potter in Leadenhall Market, soon before he enters the Leaky Cauldron and then Diagon Alley. As a muggle, I couldn't enter. 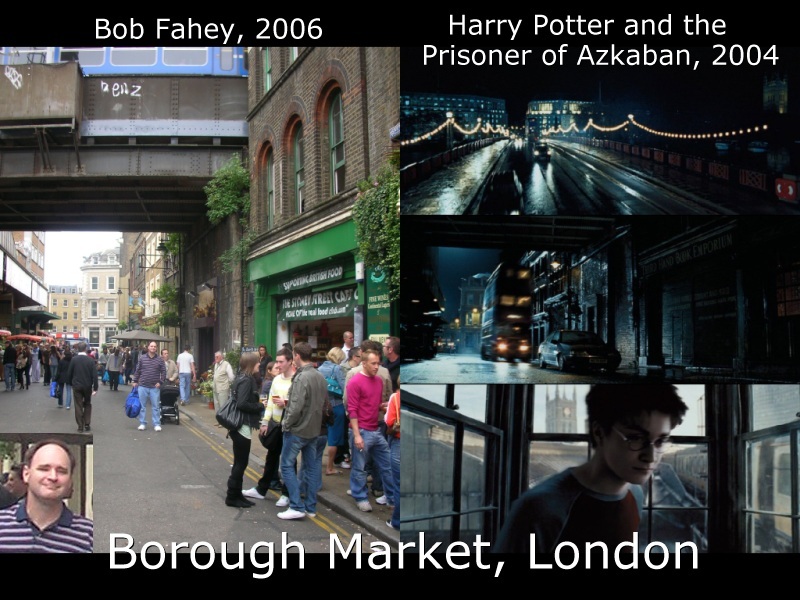 In the third movie, the Leaky Cauldron had migrated in London from Leadenhall Market to Borough Market. Details, details. 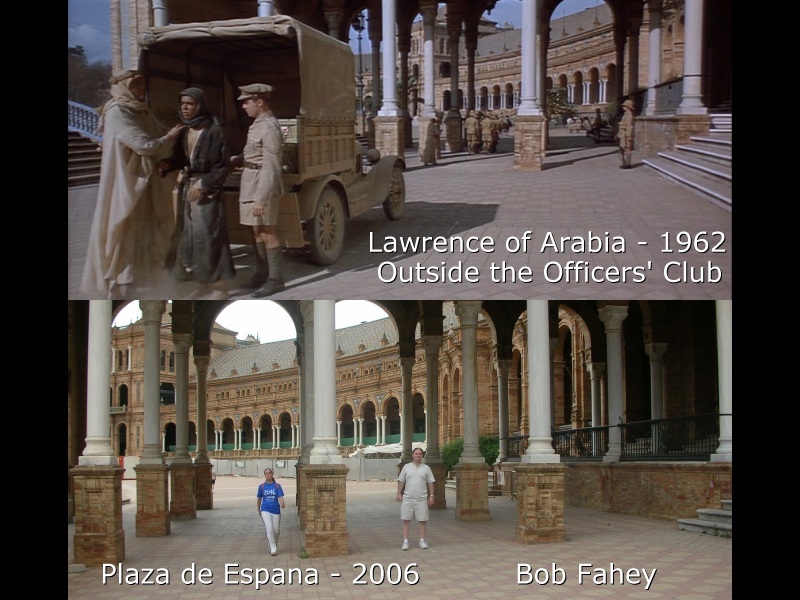 Hanging with Peter O'Toole's Lawrence of Arabia at the Plaza de España in Seville, Spain, through for him it's somewhere in the Middle East. 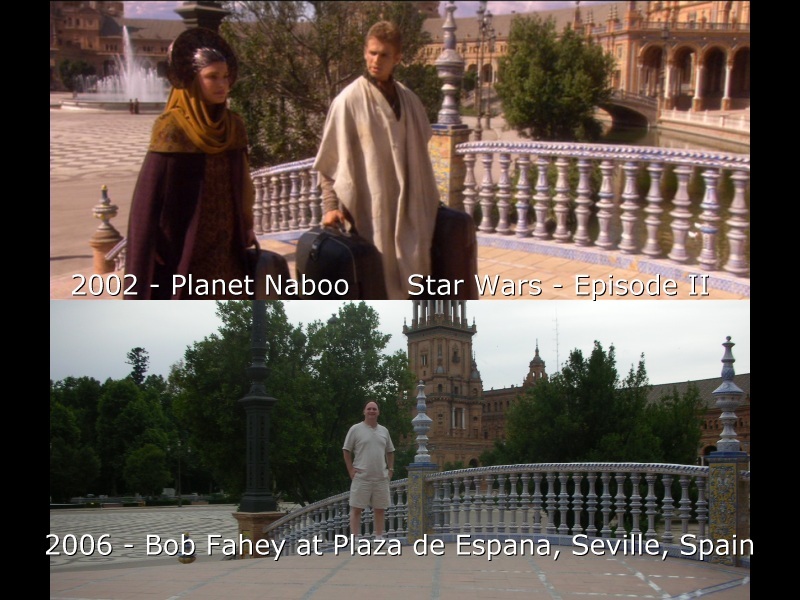 Hanging with Darth Vader at the Plaza de España in Seville, Spain, through for him it's on the planet Naboo. 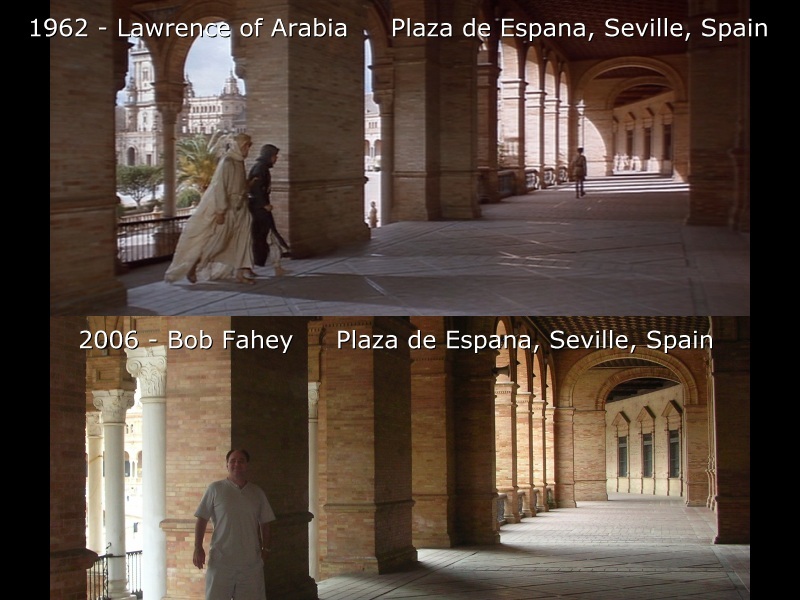 This angle at the Plaza de España in Seville, Spain was used in both Lawrence of Arabia and Star Wars Episode II: Attack of the Clones. 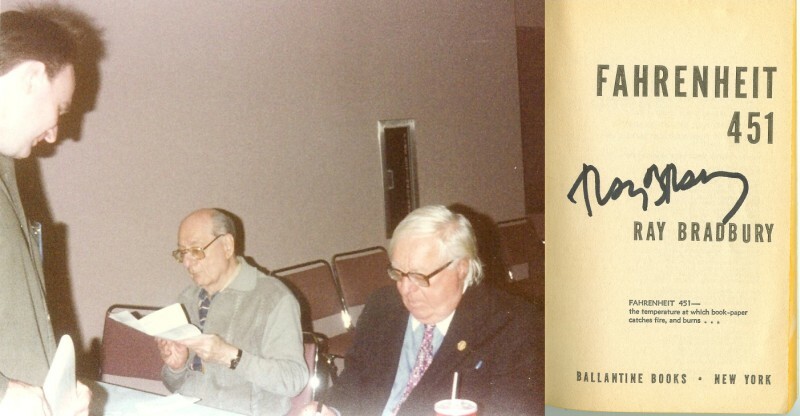 Here is my photo autographed in 2009 by two stars of This Island Earth: Rex Reason & Russell Johnson (also famous as The Professor on TV's Gilligan's Island). See my This Island Earth Page. 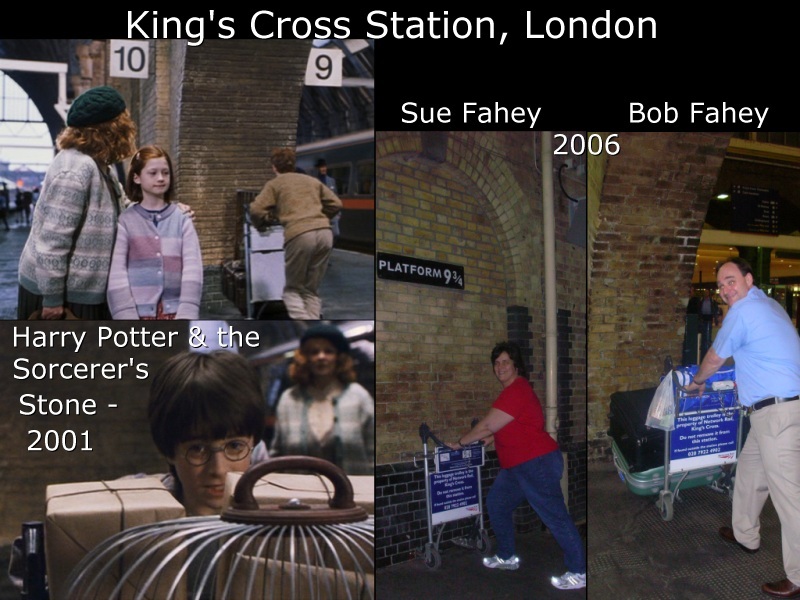 Hanging with Harry Potter at Platform 9 ¾, King's Cross Station, London. 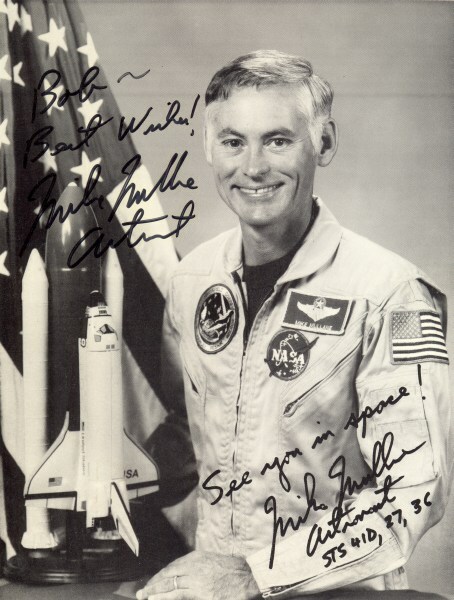 Astronaut Mike Mullane autographed this photo for me when I interviewed him in 1993. 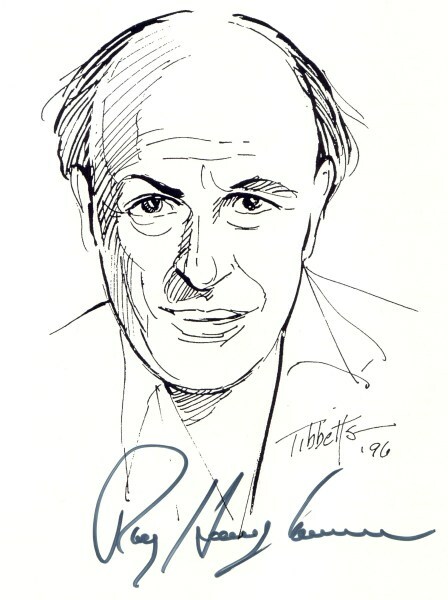 The mass-produced autograph is at lower right, and the personalized autograph is at upper left. 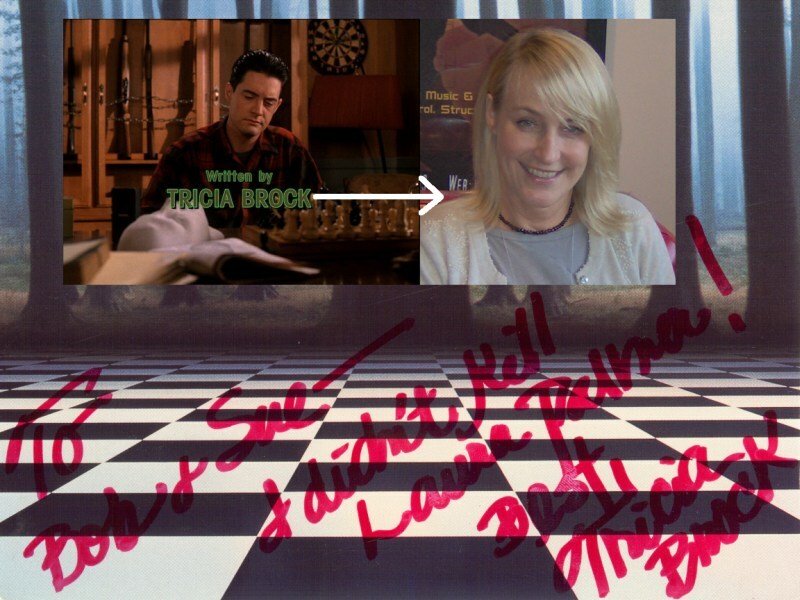 Tricia Brock wrote two second-season episodes of the TV show Twin Peaks. She autographed the back of a VHS box set to me and Sue. 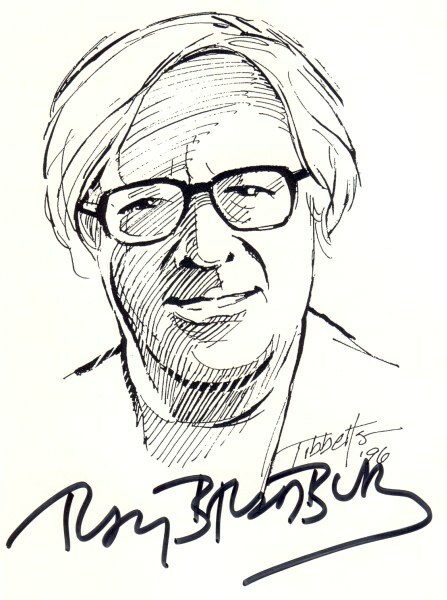 Kansas City writer Dan Lybarger got this autograph for me and shot this photo of her when he interviewed her for a film she was promoting. 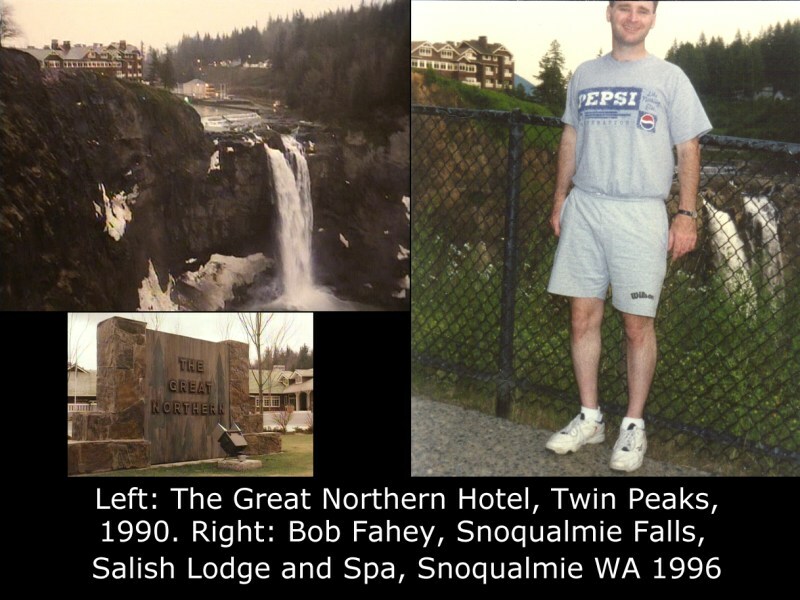 Me at the water falls and Great Northern Lodge in Twin Peaks, actually a lodge in Snoqualmie, WA. 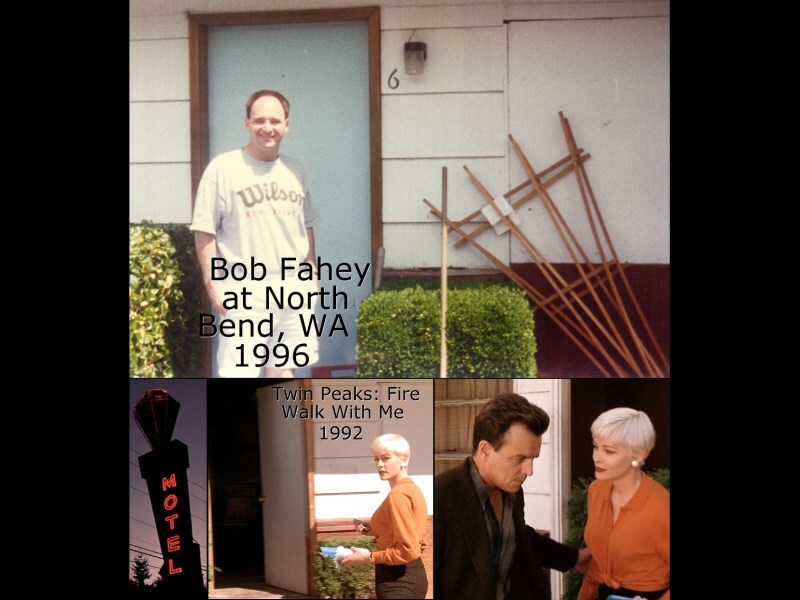 Me at a small motel in North Bend, WA, where they filmed a scene for the Twin Peaks movie. 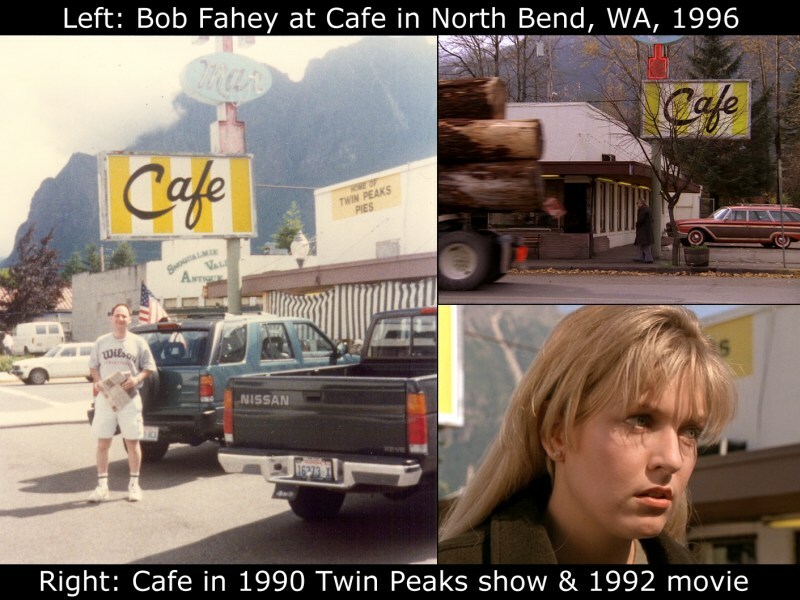 Me and Laura Palmer outside the cafe in Twin Peaks, which is a real cafe/diner in North Bend, WA. 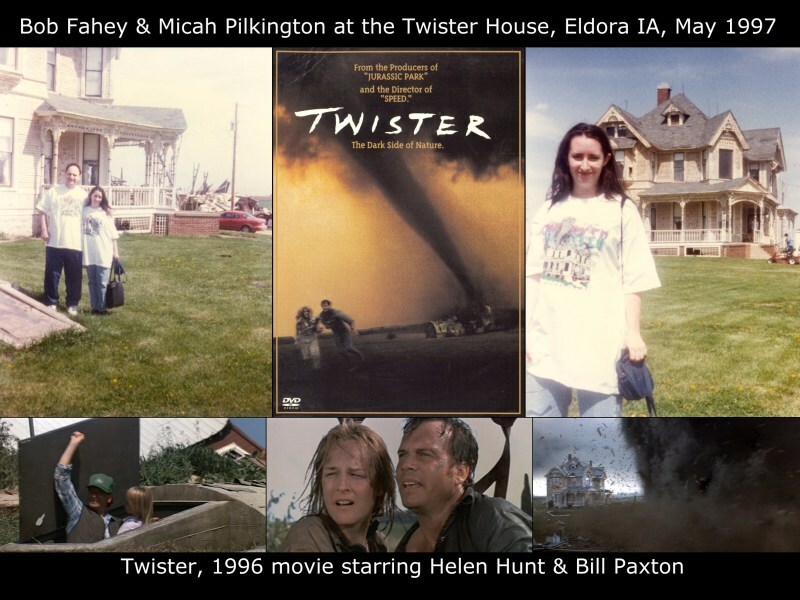 Me & my cousin Micah Pilkington at a house near Eldora, IA, where they filmed the final scene for the 1996 movie Twister. Called the Twister House, it's a tourist site. The filmmakers meant to destroy it for the movie, but locals protested, saying the house had historic value. The story was changed so the house survived the F5 tornado that passed nearby. 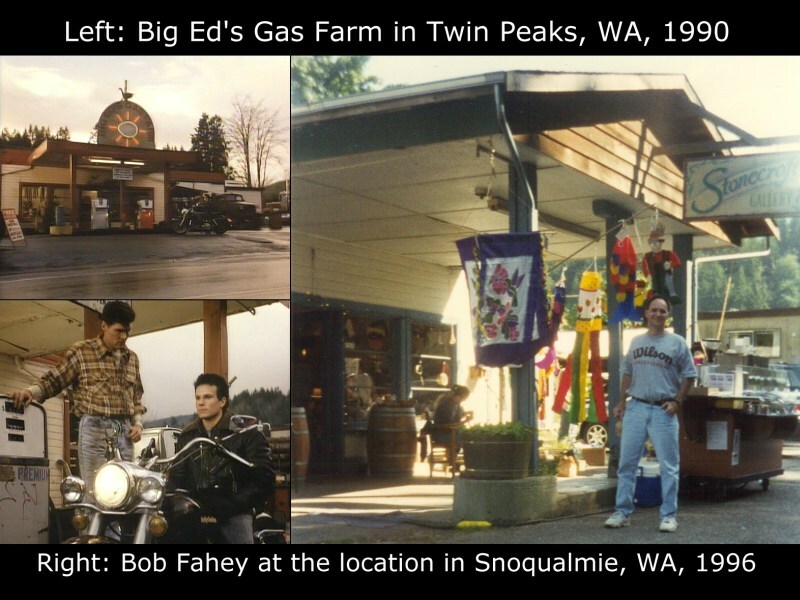 Me at Big Ed Hurley's Gas Farm in Twin Peaks, which when I visited was a kite 'n' craft store in Snoqualmie, WA. 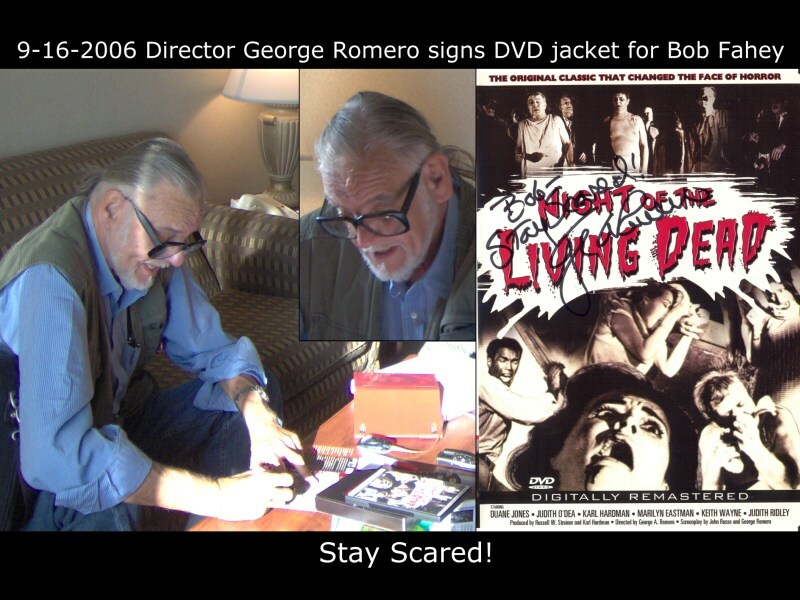 Director George Romero signs my DVD of Night of the Living Dead. Thanks to Kansas City writer Dan Lybarger, who set up the autograph and shot the photos. Anne Francis, co-star of Forbidden Planet, autographed this photo to me. 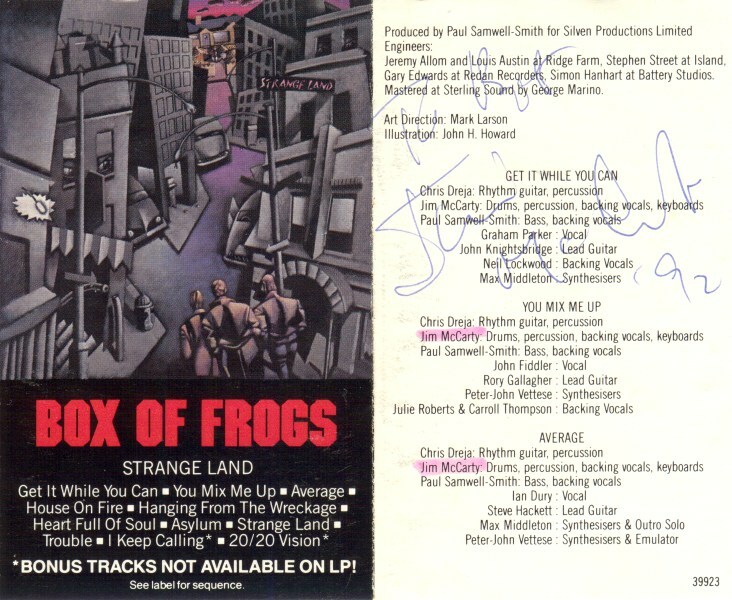 My friend Vance Powell got Jim McCarty of Box of Frogs & the legendary Yardbirds to autograph this cassette card to me in '92. 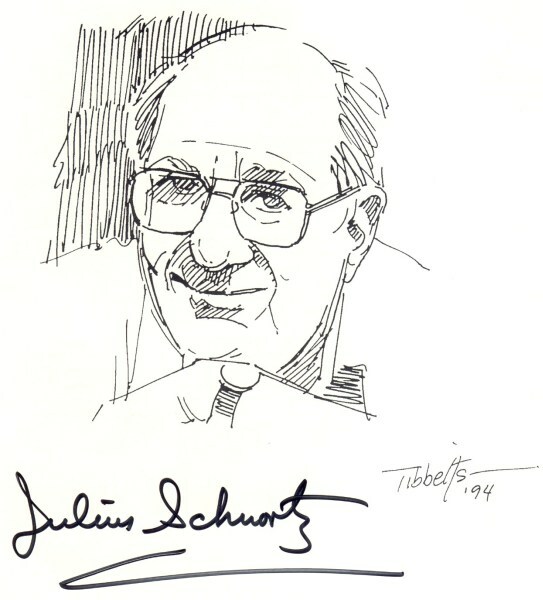 Julius Schwartz, Superman editor & literary agent from sci-fi's "pulp" era, autographed this portrait for me. 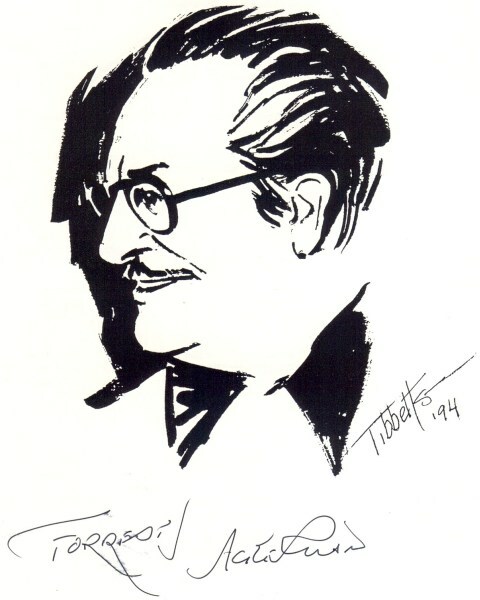 Forry Ackerman, magazine editor/publisher, collector and sci-fi icon extraordinairre, autographed this portrait for me. I said "Thank you for your magazine." He asked, "Which one?" I said, "Famous Monsters, of course!" and he smiled. 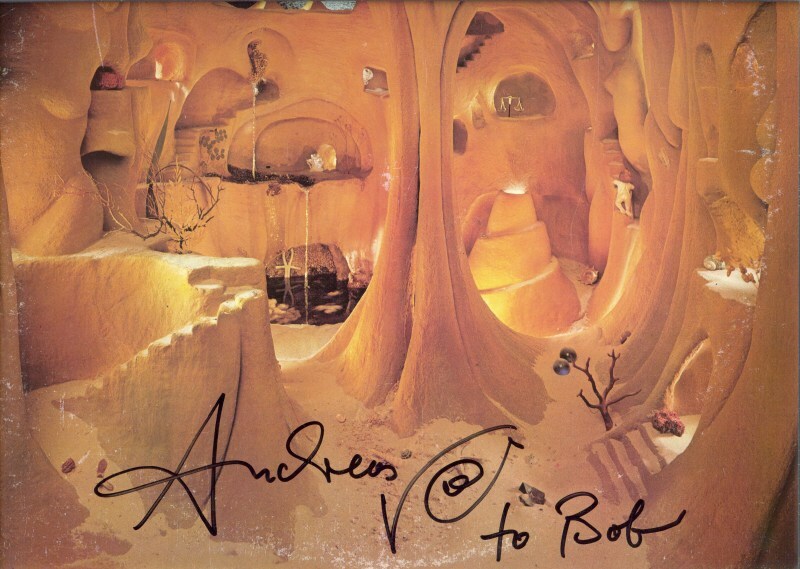 Jane Wiedlin of the Go-Gos autographed their first album to me. 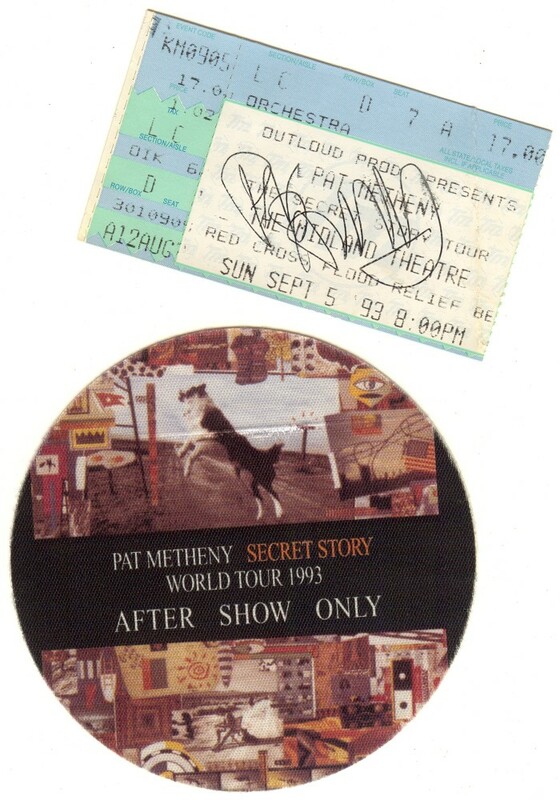 Pat Metheny autographed my ticket at the party after a 1993 Kansas City show. In the first season, James & Helen became engaged high atop Castle Bolton. Here's Sue on the same spot. 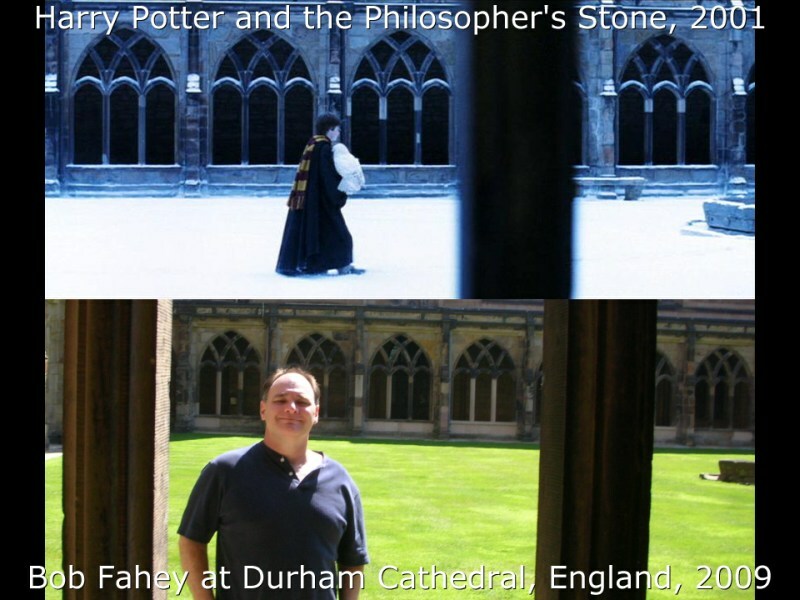 In the first season, James & Helen tour Castle Bolton. 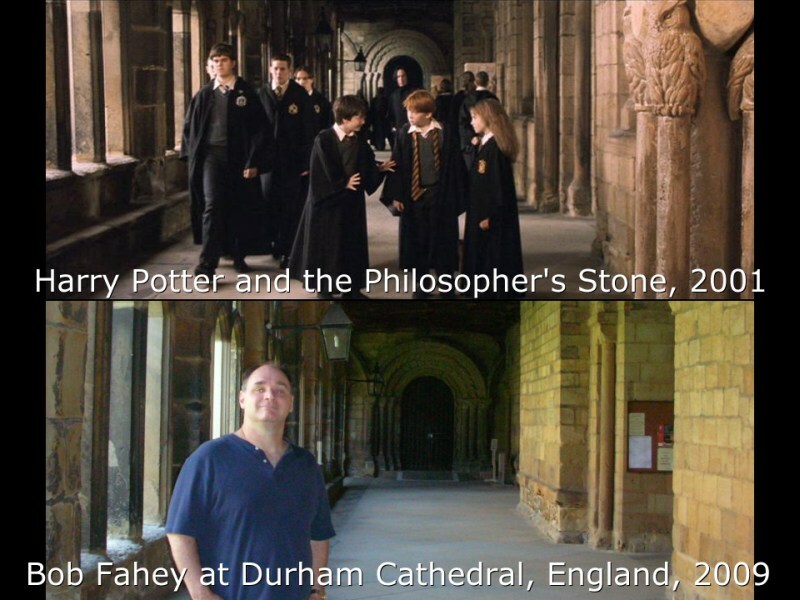 Here's me on the same spot. In the opening credits for the first few seasons, Seigfried's car crosses this bridge in Langthwaite. Here are Sue and I at the bridge. In the opening credits for the first few seasons, Seigfried's car fords the watersplash near Langthwaite. Here's me at the site. 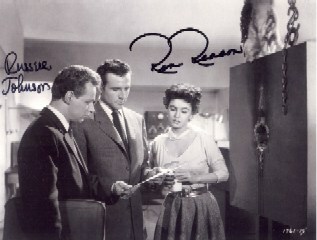 In the very first episode, James asks directions from Helen in Darrowby, here represented by Richmond. Here are Sue and I on the same spot. Click thumbnail images to see 800x600 versions. 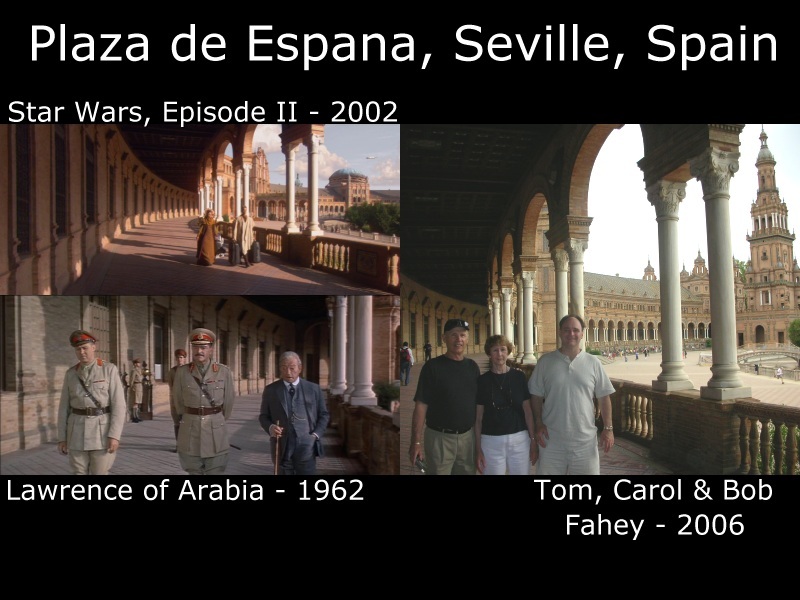 Watch this video of the opening credits to see two of these places.